We welcome the progress being made on the Declaration on the Rights of Peasants and other people working in rural areas. We note the important role declarations play in the development of international law. 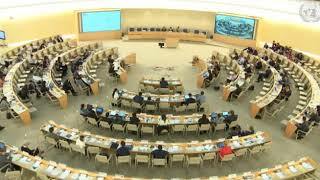 The Human Rights Council itself may not have existed without the adoption of aspirational texts by the General Assembly in 1948 and the World Conference on Human Rights in 1993 calling for the development of international human rights law. We very much welcome the experts’ suggestion, supported by numerous States, of including food sovereignty and the term “Mother Earth” in the Declaration. The importance of having a voice in shaping one’s own food supply and agricultural system is critical in many ways, especially for those in rural areas who play the most critical role in our food production. We regret the views of States that seek to dilute existing legal obligations by changing them into non-obligatory language in theDeclaration. This Declaration must not distract from existing legal obligations but must build on them to address the vulnerabilities, and support the human rights, of peasants and other people working in rural areas. International-Lawyers.Org and Geneva International Centre for Justice hope the Working Group will adopt the strong and well-motivated positions endorsed by the experts in constructing a Declaration that is an important step in ensuring the rights of peasants and other people working in rural areas.